Do You Have the Best Family Vegetarian Recipe? Cedarlane Foods Wants It! The following is a post sponsored by Cedarlane Natural Foods. For our sponsored post policy, click here. Are you a good cook? Do your family and friends rave about your dishes? Or how talented you are at whipping up the healthy tastiness in the kitchen — especially of the vegetarian variety? Then this Cedarlane Natural Foods contest is so, so, SO for you. 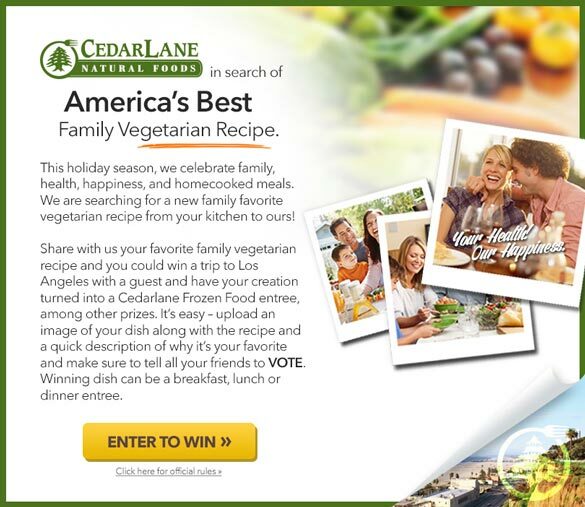 That’s right; Cedarlane’s Search for America’s Best Family Vegetarian Recipe contest is a nationwide recipe contest that celebrates the company’s focus on family, lifestyle and healthful home-cooked meals. Starting today and running through December 30, you can submit your fave vegetarian family recipe on the company’s Facebook page. And here comes the really cool part: the winning dish will be introduced as a Cedarlane frozen entrée! The winner will also receive a supply of their entrée, plus a trip to Los Angeles with one guest that will include hotel accommodations, airfare, a day at a Southern California theme park (! ), and a tour of the Cedarlane campus. Additionally, the winning recipe will be featured on the Cedarlane website complete with an online, real-time introduction of the winner. You’ll pretty much be famous, ya’ll. Ready to submit your recipe? Here are the deets: Participants will be asked to include a description of the recipe, why it is a family favorite and a photo of the dish. The top five entries with the most Facebook likes will be named as finalists, and then a winner will be selected by Cedarlane nutritionists and advisors who are seeking that special dish with unique flavor combinations. To be eligible, each special recipe must be a vegetarian breakfast, lunch or dinner entrée. For complete giveaway details, prize fulfillment, information and official contest rules, please visit Cedarlane’s official contest page.